Villa Paradis' superb views over the Binibeca coastline to the sea, high quality interior and great central location secure its well earned position as part of our Very Villa Plus programme. The villa has beautiful gardens surrounding the pool which is raised and shielded from the street by colourful flowers and hedging for a good deal of privacy. Binibeca is one of the islands most authentic and traditional resorts, and its picturesque beach and choice of shops and eateries are all within a very short walk. WiFi and air conditioning/heating in the bedrooms and lounge is included. 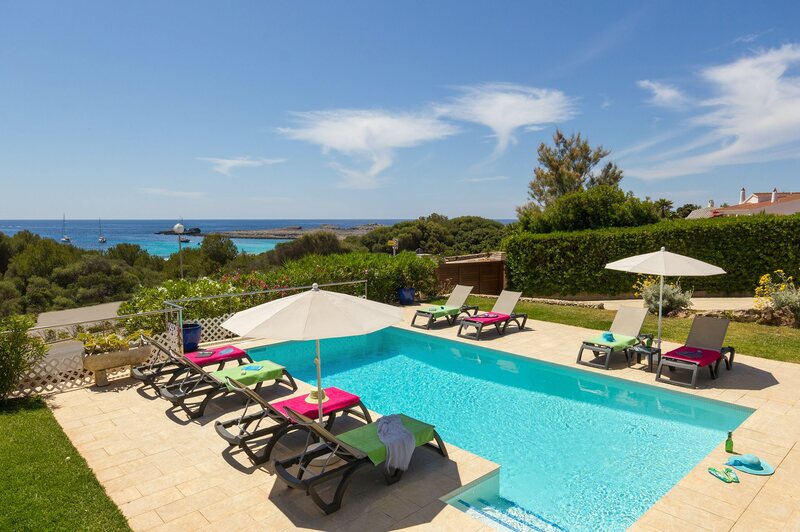 Outside, Villa Paradis has a wonderful lawned garden and private saltwater swimming pool overlooking Binibeca beach and the open sea. The raised terrace has a seating area and a table and chairs for alfresco dining in respite from the sun as you admire the scenery. The villa has a private driveway which is gated from the road with space for 2 cars should you wish to hire them. Steps lead from the pool terrace and driveway up to the entrance. From the central entrance hallway the living area is on the left and bedrooms further down the hall on the right. The living area has ample seating and a dining table and chairs under a traditional beamed, sloping ceiling. Patio doors on 2 sides of the room open onto the raised, covered terrace overlooking the pool and gardens to the sea. The fully equipped and traditionally decorated kitchen and utility room are adjacent. To the right of the hallway is a double bedroom with patio doors allowing a good sea view and access to the terrace, and an open en suite shower room and dressing area. Along the hallway is a shower room and bathroom and 3 steps up to the twin bedrooms. A second hallway from the twin at the end of the corridor gives access to the second shower room and double bedroom which also has patio doors onto the terrace at the side of the house. Tourist Licence Registration: ET 418 ME. Villa Paradis enjoys a marvellous position above Binibeca beach boasting fantastic views out over the sea. The villa sits between Binibeca Vell fishing village and Cala Torret, both resorts having a great selection of shops and restaurants to choose from. Binibeca Vell has a choice of quaint souvenir shops to browse. For a taste of traditional Spanish life, Sant Luis is a 10 minute drive inland. The village is fantastic for shopping and has fresh fish and meat for sale. It only takes a few minutes on foot to reach the beach which has a good beach bar where you can sit and enjoy a cool drink and a bite to eat. Or venture into Binibeca Vell which has a choice of good restaurants. The islands only stretch of coast road connects Binibeca to Punta Prima which has a choice of superb restaurants overlooking the beautiful sandy beach. In high season the road train trundles along the road with panoramic sea views on one side, traditional Spanish houses and flower gardens to the other. Sant Luis also has a number of tapas restaurants. Binibeca has a beautiful sandy beach, just across the street from Villa Paradis. Neighbouring Punta Prima is home to one of the islands 3 waterparks, Splash! Or for anyone who does hire a car, the popular Lloc de Menorca Zoo is within easy reach. The resort also has a mini golf course. Binibeca Vell has a maze of whitewashed houses down cobbled streets, overlooking the open sea - one of the most photographed spots on the island! For a taste of traditional Spanish life, Sant Luis is a 10 minute drive inland. Or visit the capital of Mahon, just a 15 minute drive away. In the evening the harbour side comes alive with restaurants and bars of every type and style. The islands only golf course is in Son Parc on the North coast, around 40 minutes' drive from Binibeca. In the middle of the island is Menorca's highest peak, Monte Toro. The drive up to the top is an adventure in itself with fantastic views over the island. At the top is a statue of 'Jesus of the Sacred Heart' and a viewing platform where you can enjoy panoramic views over the whole of Menorca and even across the water to Mallorca on a clear day. There is also a restaurant with tables outside so you can admire the scenery as you stop for a bite to eat, and a good gift shop, as well as a garden cared for by the community of nuns who live there. Villa Paradis is not available to book for season as it is sold out. Take a look here at the Menorca villas that are currently on sale. Menorca is definitely the place to be for anyone wanting to experience watersports on their villa holiday! Professional centres with modern teaching techniques and equipment to hire make it all so easy, even for beginners. Menorca's prevalent winds and summers breezes provide perfect conditions for windsurfing or sailing and diving is also very popular with a great deal of sea life and underwaters caves to be explored!|Some of the main beach resorts have windsurf boards and small sailing dinghys but Fornells, on the North coast of the island, in particular, is home to some of the best windsurfing and sailing facilities in Europe.